There are some amazing numbers coming from the overnight runs of the computer models. Bottom line, it’s going to be HOT and DRY for the foreseeable future. As I mentioned yesterday, rain isn’t going to happen anytime soon. Even if we were to get a little bit of rain, it wouldn’t come close to putting a dent in to the drought. But since I know a lot of you want to know whether or not we’ve got rain coming, let’s get this out of the way. To start with I took a look at rainfall numbers from two computer models. To be honest, NOAA’s global forecast model is so far out in left field lately, it has left the stadium. This turns me to the European forecast agency’s computer model, which has been doing very well as of late. These numbers may be troubling and aren’t for the week of heart of you are in need of rain. More pressing is going to be the excessive heat. Yesterday, I first mentioned on Twitter that the European computer model was suggesting we could see seven consecutive days of 100°+ temperatures in east/southeast Missouri. Last night’s run has upped the ante. 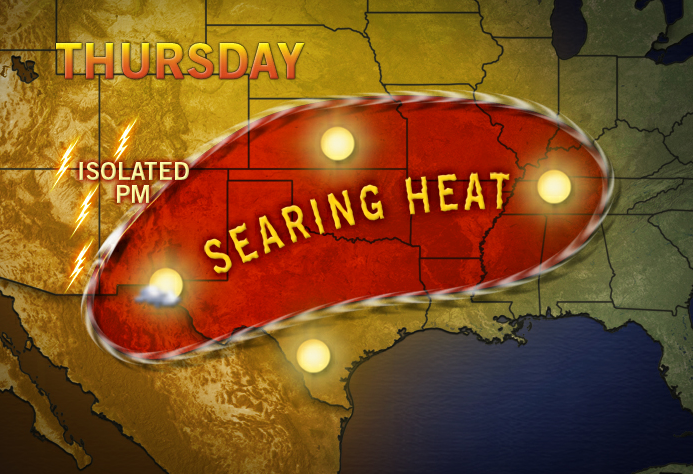 It is now suggesting that we could see ten consecutive days of 100°+ temperatures beginning Thursday. Yes, 10! That would take us from Thursday, June 28 to Saturday, July 7 with daily high temperatures in the triple digits. I have averaged what two computer models are suggesting for temperatures Thursday/Friday across select locations. The one saving grace to oppressive heat is that it appears temperatures will be able to drop quite a bit overnight. Meaning, temperatures will be able to fall off to the 50°s, 60° and 70°s. Often times, when we have extremely high temperatures, there is never a “cooling off” period overnight as temperatures will only drop to the upper 70°s and 80°s. I mentioned this yesterday but it is worthwhile mentioning again. Heat is the biggest weather killer. Hundreds die from heat each year. Unfortunately, there has already been someone killed from the heat. Let’s try not to have any more people die from the heat. If you have air conditioning, turn it on. I know many people do not want to spend the money running their air conditioning but this really could be a matter of life or death.